Thermal imaging is a valuable resource for maintaining electrical components and reducing the risk of electrical breakdowns and fire. Using the latest in thermal imaging technology, we can find overloaded circuits before equipment fails, reducing the cost of downtime. The thermal image camera will detect heat or overloaded electrical connections known as hot spots and show early warning signs that electrical components are at risk of failure including fire and switchboard damage. Thermal imaging for all your building’s switchboards should be carried out every 12 months and more frequently if environmental conditions are influential. Many insurance companies are now making thermal imaging a condition of policy renewal. Thermal imaging is a non-destructive defect testing technique, which means there’s no interference to your building’s power supply during a preventative maintenance check. 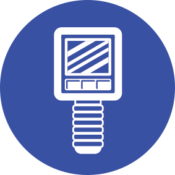 Switchboard thermo scanning is undertaken while the equipment is on-line and running at normal capacity. All of our inspections are performed by qualified electricians with Level 1 Thermography certification, and are accompanied by detailed reports and technical assistance to commercial, retail and industrial customers.